You are here: > Home > Blog > Will The Powerwall Solve Energy Storage? What you have to admire about Elon Musk is his vision. He’s a billionaire who can step back from the day-to-day problems and look at the ‘big picture’. Aside from electric cars and space, his latest project is based around how to move the world from carbon-based fuels. The Tesla idea is that a lithium-based battery pack called ’Powerwall can store energy generated from solar PV panels fitted to your home or electricity taken from your local Grid connection when utility rates (costs) are lowest (overnight). During the day Powerwall can then discharge automatically to power devices with this stored energy rather than using electricity from the Grid connection. Powerwall can also provide a source of battery backup to your home should the mains power supply fail. Powerwall is available in two sizes for domestic applications. The 7kWh Powerwall is recommended for lowering electricity usage costs for domestic appliances and electronic items, with the 10kWh version covering this function as well as extra for emergency power failures. Just how important is domestic battery backup? Well up till now if you worked from home or just wanted to keep your IT, TV and games consoles running you needed an uninterruptible power supply (domestic UPS system) when the mains power supply failed. Installing a Tesla Powerwall means that you don’t need to invest in small UPS systems for your home devices. The Tesla Powerwall provides this UPS function and as the main power storage device within your home acts much like a centralised UPS system or generator within a datacentre. With more home based workers this UPS function appears to be an instant advantage, especially as established electrical supply Grids are becoming less stable, leading to more mains power interruptions. The Tesla Powerwall also allows you to go ‘Off-The-Grid’. In some parts of the world , going ‘Off-Grid’ is a choice but in others it is mandatory where there is either no or a very infrequent electrical supply. In these areas, Tesla expects the Powerwall to be a disruptor again. In Africa, phone coverage was made easier to implement using mobile phone rather than traditional telephony systems requiring poles and cables. With Powerwall, Tesla will be able to provide electrical power connected to solar PV installations and without a local grid connection. Power measures the rate at which energy is used. The power used by a device is measured in Watts (W). When we refer to sums above 1000W, we convert this to kilowatts (kW) by dividing the total Watts by 1000. Electronics and electrical devices require electricity to power them. Each device will require a certain amount of Power measured in W, kW or even Megawatts (MW) or Gigawatts (GW). The Power required is generally stated in literature, manuals and specifications or can be measured using the appropriate device i.e. a clamp meter. Power also measures the rate at which energy is generated. Standby power generators are sold at specific unit sizes: 10kW or 100kW generators. Power stations are said to be 5MW or 1GW in size. When you turn on an electronics or electrical device it will draw power from its local electrical supply (or internal battery). The connection may be ‘plug-in’ or via a hardwired connection made by a suitably qualified electrical contractor or electrician. Energy measures how much fuel (in this case electricity) is contained within a fuel source or used over a specific time period. Note this is why foods are given a calorific value. The calories measure the energy within the food. The electricity supplied to a building is the energy used within that building. To charge for this, Utilities require a unit of measurement (kW) for a given time period (1 hour) to which they can attach a price or rate. The standard unit of measurement is kWh (kiloWatt-hours). 1kWh is the amount of energy converted if work is done at an average rate of one thousand watts for one hour. The continuous power that the Powerwall can provide is 2kW (2000W) or 3.3kW (3300W) peak. This peak is a short-term overload to cover device start-up and boot-up but this switch-on surge must be short-term otherwise we presume the Powerwall will switch out of circuit to protect itself. Understanding Power and Energy is important here because it puts the different power ratings of the Tesla Powerwalls into perspective. The 7kWh device will deliver 1kW for 7 hours and the 10kWh device 1kW for 10 hours. At a full 2kW load (which is 2×1kW) the duration of the supply available from a single Tesla Powerwall should reduce respectively to around 3.5 and 5hours. However, Tesla Powerwalls can be run in parallel (if you have the wall space up to 9 units) and so the overall rating and energy storage times can be increased up to 90kWh and 63kWh. 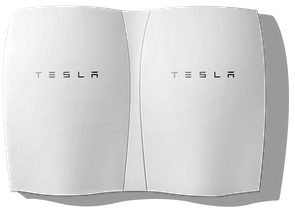 The Tesla Powerwall comes with a 10-year warranty and is designed to be wall mounted. The device housing is stylish and comes in 7-variant colours so you can have one with the Tesla logo on your home that will match or stand-out as you choose. The Powerwall is suitable for either single or three phase electrical supply installation. Costs for the UK are yet to be set but in the US a 7kWh model will retail for US$3000 and a 10kWh model for US$3,500. These figures are low for a lithium-based device but users also have to consider the cost they pay per kWh. Based on this will determine their payback period which could range up to 5 years or more. Whilst Powerwall is a self contained system, other associated costs include electrical installation and also the cost of a suitable electronics DC-AC inverter. As the Powerwall is not exporting to the grid but using power locally, the choice of solar inverter system is less restricted. If payback is not as important as reducing CO2 and being environmentally friendly and green then Powerwall ticks the box given that Tesla have solved the power stability problems that are commonly associated with lithium-ion batteries; just look at their electric cars. Tesla has also developed a product for the grid level. In fact, the building where Elon Musk delivered his presentation was powered solely from his company’s 100kWh Powerwall devices. Grid energy storage again is a rising issue for many developed countries. The Powerwall could provide an answer to many of the problems faced here but it must compete against other technologies including: pumped hydro, compressed-air generated power storage, fuel cells and even developments in new lead acid battery products. An advantage of the Powerwall at 100kWh is that it can scale infinitely allowing 1GW scale energy storage facilities that can power towns and cities. I believe Tesla are on the right track and that the UK will see the Powerwall being adopted into UK domestic solar PV applications. We look forward to being able to install these devices as part of our solar PV and energy storage systems.